This week I shared How I Created My First eBook, complete with helpful links. I hope this is helpful to those who wish to tackle this project. On the Daily PlanIt Facebook page, I shared a great free tool from David Meerman Scott, a Free Marketing Strategy Template. Plus a lot of other neat stuff, like the Happy song by Pharrell Williams. I was shocked and dismayed by the results! Let’s just say that it said I’m strongly left brain. Sure, I get that I like to make lists and organize things, and that’s a left brain function. But I highly value creativity and art, and like to think I’m at least a little bit creative. So I was very disturbed to see this result. It bothered me so much I decided to re-take the test, and then take a closer look at what it is based on. The second time it came out a little better: 69% left, 31% right. I looked at the explanation of the test which came up after the test was completed. 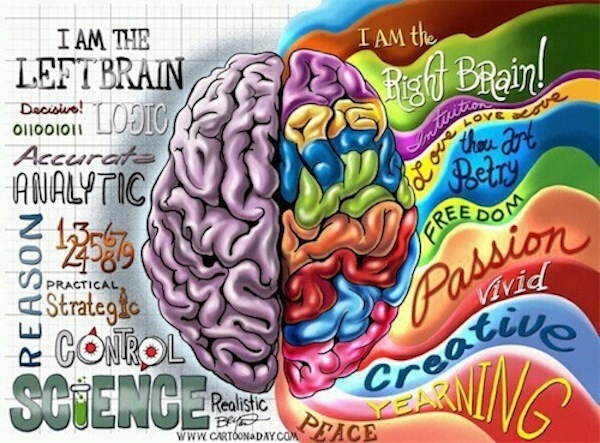 Then I found this article at http://www.livescience.com/39373-left-brain-right-brain-myth.html and was reassured that brain dominance is not something to get worked up about. As long as you have a functioning brain, that’s the main thing! Still, I may try to spend some more time exercising my creative side. Have you heard comedian Jeanne Robertson talking about her left-brain husband? She is one funny lady! Want to see more? I invite you to “like” the Daily PlanIt Facebook page and follow me on Pinterest!